Learning how to play blackjack at a casino can be intimidating. When you go to Las Vegas and sit at the table you have to worry about making the wrong move that can affect the entire table. We know that and set up a way for you to learn how to play blackjack for free. 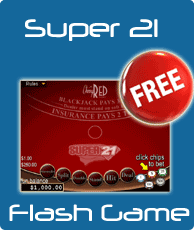 The blackjack game on this page plays just like the ones you will find in live casinos. The rules are nearly identical to what you will find in Macau, Las Vegas and Atlantic City. The game uses six decks in a continuous shuffle machine. The dealer hits soft 17. Pairs may be split into two hands. All split hands may be hit except for aces, which receive just one card. Players may double down on any two cards and after splitting. Blackjack pays 3-2. You start out with 1,000 play chips. You may bet anywhere from $1 up to $100. Once you have the cards you can decide how to play the hand. Stand – This is what you do when you do not want to draw any more cards. Hit – This is what you do when you wish to draw an additional card. You may hit until you bust over 21 or decide to stand. Double Down – Double your original bet and receive just one more card. You must stay with this card and cannot draw more. Split – Turn a pair into two separate hands. Each paired card will start out a new hand that will receive one additional card. From there, you may hit, stand or double down, except on aces, which only receive one card. Once the hand is over it is easy to move on to the next one. Simply click the rebet button and the cards will be in the air instantly. 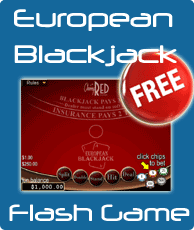 The blackjack game above may be found on Real Time Gaming platforms. You can play for real money there or continue to practice. As you will see by playing, it is one of the fastest in the online casino industry. In addition to the no download version available here, there is also a download version available. 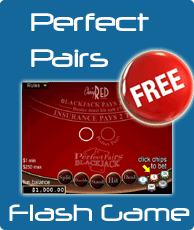 You will need Adobe Flash Player to use the free blackjack game.